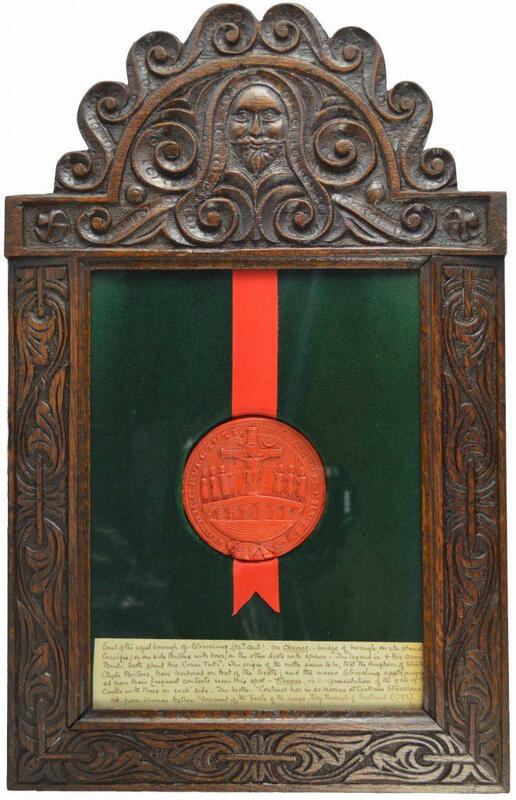 This display box of carved oak contains a wax copy of the seal of Stirling. It was found at auction by Friend of the Smith Dr Robin Campbell and is a recent purchase for the Stirling Smith courtesy of the Stirling Common Good Fund. Famously, it was William Wallace who repelled invaders at the Battle of Stirling Bridge, 11 September 1297. The matrix from which this seal was made was recently examined by an expert from the National Museums of Scotland, and it was found to be original, probably dating to 1296. There’s a rather different interpretation with additional background information on Stirling’s Wikipedia page. Has anyone had the Latin translation checked recently? Do we know who authored the 19th century translation you’ve given? Thanks for your comment.There’s a lot of literature on the seal of Stirling and we follow the information gathered by James Ronald, published in the Transactions of the Stirling Natural History and Archaeological Society, vol XVIII pp4 – 32, 1895.The translation given there is not much different that worked out by Professor Archie Duncan in the late 1990s, when he was writing around the time of the 700th anniversary of the battle of Stirling Bridge. Sorry, we do not have the reference to hand. The four line rhyme is by the physician and antiquarian Sir Robert Sibbald (1641 – 1722).